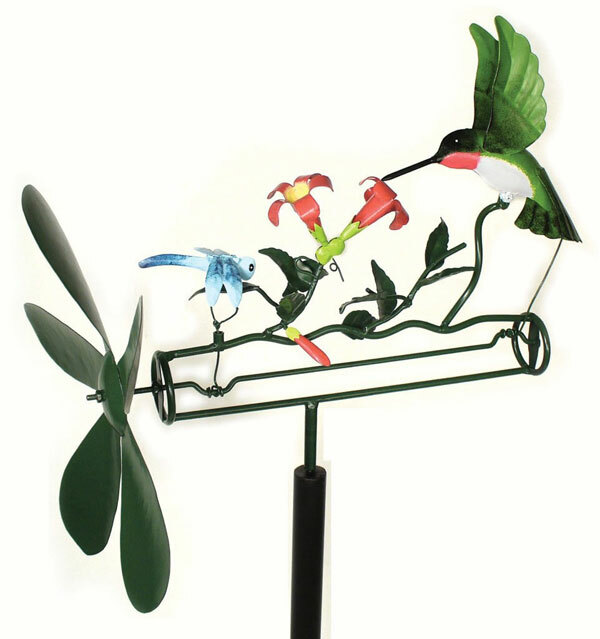 This Hummingbird and Dragonfly Whirligig will add a delightful addition to a yard, patio or hummingbird flower garden. When the wind blows at propellers the hummingbird hovers and feeds at flowers while the dragonfly flaps it's wings. Individually boxed for gift giving. Whirligig dimensions: 9.5 inches X 12.5 inches. Total dimensions with pole; 9.5" X 12.5" X 55"
Most orders leave our warehouse within 1 to 2 business days! I promise to use it only to send you "The Hummer" Newsletter. The Hummingbird Lover Starter Kit. Everything You Need to Get Started. The Hummingbird Lover Starter Kit includes everything needed to start attracting, feeding and enjoying hummingbirds! on Your Entire Order in Our Store! We promise to only use your email for our Newsletter. We will absolutely NOT share your email with anyone.